I was planing on soaking cherries in bourbon, but got ahead of myself and consumed the cherries on its own. I did, however, have grapes that were too tart to eat. Rather than waste them, I decided to put them to work for me. The result is gorgeous to look at and makes for a sweet dessert drink. 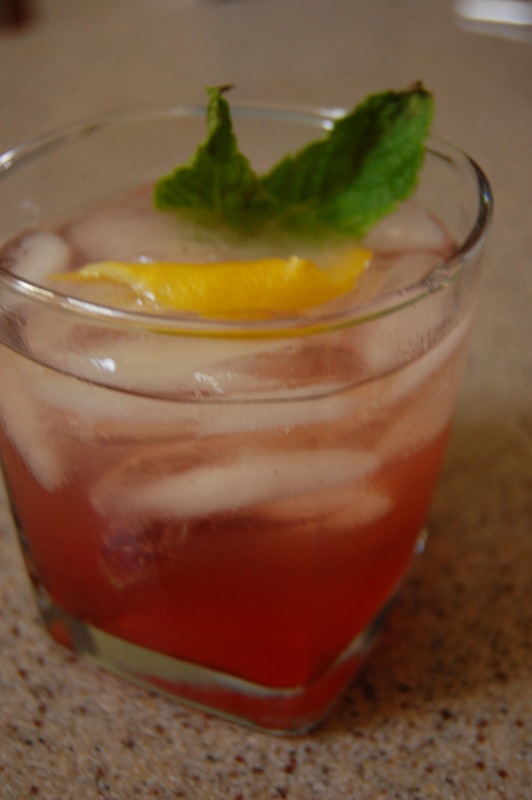 Or, you can make a refreshing cocktail, as I do here. Disclaimer: the resulting fruit is boozy and most definitely an adult treat. 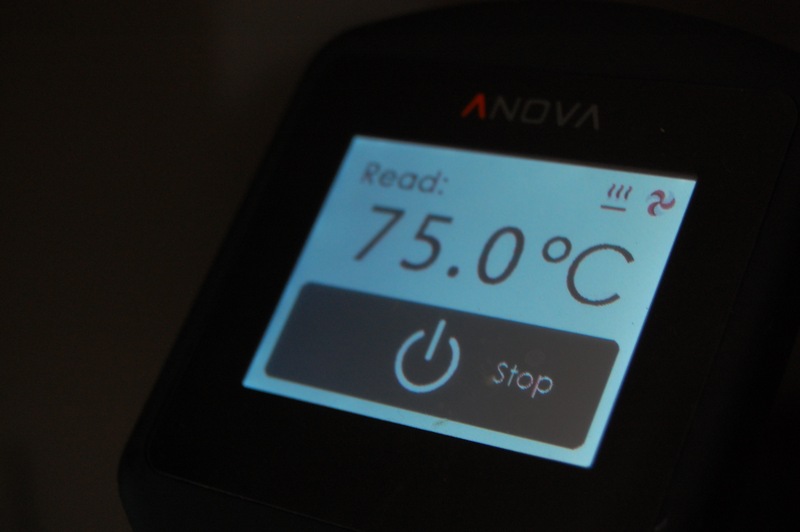 Set the Anova Sous Vide Precision Cooker to 167ºF (75ºC). Combine grapes, sugar, bourbon, vanilla bean, lemon peel, star anise, and cardamom in a large zipper lock bag. Seal the bag using the water immersion technique and place in the water bath. Set the timer for 2 hours. When the timer goes off, remove the bag from the water bath and transfer to an ice bath. 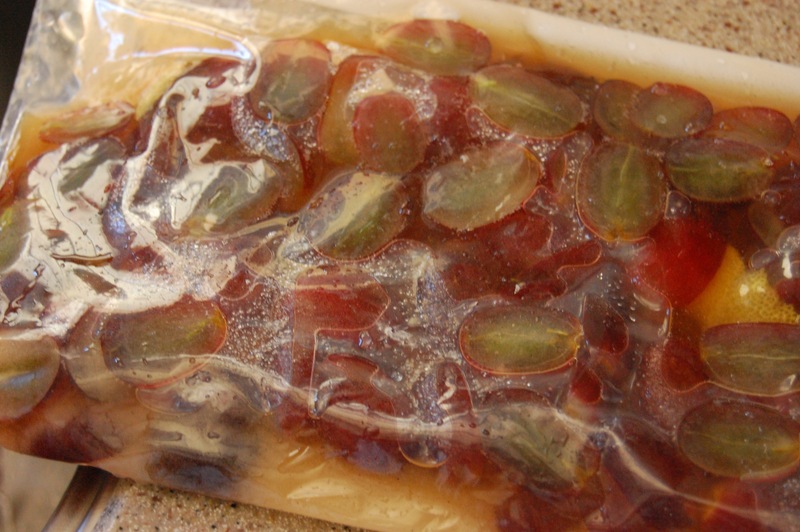 When the grape mixture is cool, transfer to the refrigerator until ready to serve. Strain the grape mixture through a fine mesh strainer set over a large measuring cup. Reserve fruit for another use (like a compote or over ice cream). Fill rocks glass with ice. Add 1/2 cup ginger beer. Top this with 1 1/2 ounces infused bourbon. Garnish with mint, lemon twist (twist peel lightly to release lemon oils), and sliced grapes. Serve.